Saturday April 22 1911 Will & I worked most of the forenoon cleaning the chicken houses. He went to town at 12.15 I at 2.15 to attend The Musical Festival at The Amory. I got home with Will at 4.30. I set 5 hens got the supper and went back at 7.15. Met Cora at the store and we went in the evening. I did not get home till late. A letter from Lydia. Sunday April 23 1911 It was a year today since we had the big snow and freeze. I did not go to church. Went down home in the afternoon to visit with Allie Halsom. Home all evening Wrote to L.D. Lindley Monday April 24 1911 Will helped me do the working. A letter from Lizzie. I wrote more and some other mail ready. I ironed in afternoon. Will went up to see about getting fence parts. Mr. Vaughn helping him. 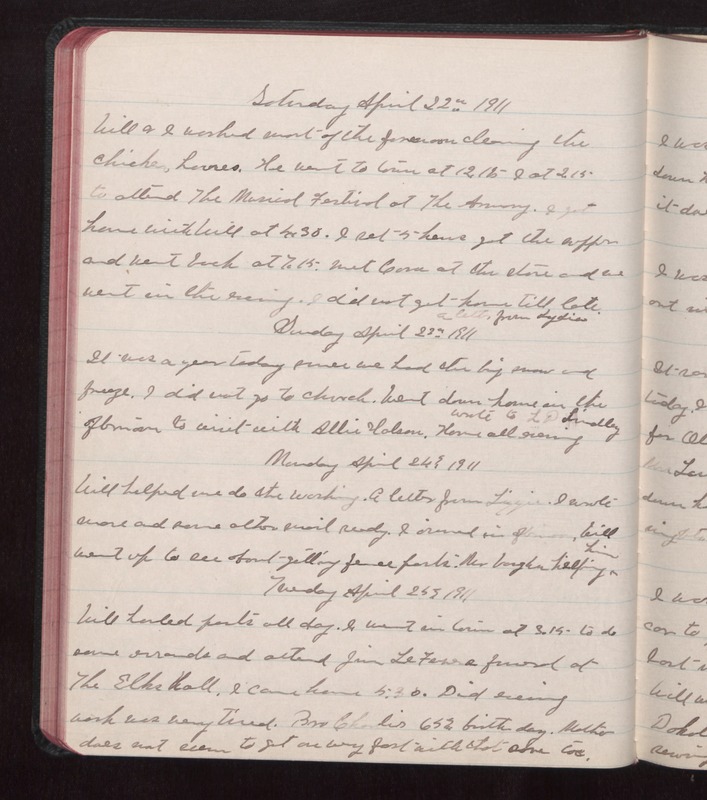 Tuesday April 25 1911 Will hauled parts all day. I went in town at 3.15 to do some errands and attend Jim [LeFevere?] funeral at The Elks hall. I came home 5.30. Did evening work was very tired. Bro Charlies 65th birth day. Mother does not seem to get on very fast with that sore toe.